Brookite is VERY rare for Arkansas, and this is a superb example: 5/16"x 9/16"x 1" tall, this Collier's Creek gem clear rock crystal thumbnail has FIVE brookite inclusions and penetrators to the second largest crystal, and ANOTHER in the crotch between them. A fine, classic orange tabular crystal of 1/32"x 1/16" next to a curved 1/16"x 3/16" blade, shows very well. 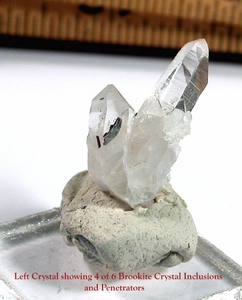 Look more closely to see four hairline brookites: one inside the prism-termination meet which has THREE extra faces, two in the milky side towards the base, and the one in between these two larger crystals. The longer crystal, bent and thusly also rare, has growth marks and an after-calcite 1/4"x 1/4" pocket with drusy and glittering tiny crystals. Fleabites and record keeper noted. So: a BENT crystal, a NINE-faced crystal ultra rare, and SIX high quality inclusions that are RARE to location - WHAT a treasure for your collection!